From my Oven is filled with delectable recipes, tried and triple-tested by author and well-known hostess, Fay Lewis. Step-by-step instructions and hundreds of beautiful photographs take the mystery out of this exact science, inspiring those who have never had the courage to bake, to produce cakes, biscuits, scones, breads and croissants. 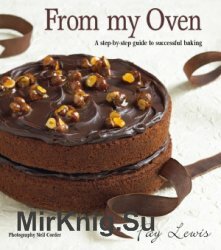 Slightly more challenging recipes will appeal to seasoned bakers who will delight in the variety of recipes on offer. From my Oven is the ultimate home baking book and no lover of baked goods.